Glad You Asked. Let Me Help. "Where is Jamaica? ", why would someone really asked such a question? Honestly, it really never dawned on me that someone would really ask such a question. The truth though, is that, on the bigger world stage, Jamaica is just a tiny dot. It is simply because of our athletic prowess, our food, our music, our dance , and of course, our prestine white beaches and friendly personality of our peoples that drove our popularity. Read more on why is Jamaica famous here. But even with its enviable popularity, there are still billions of people across the world who may have only heard the name, if at all. So to answer your question, here we go! It is located between 77° to 79° western geographic longitude and 18° northern geographic latitude (see above), in the continent of North America. 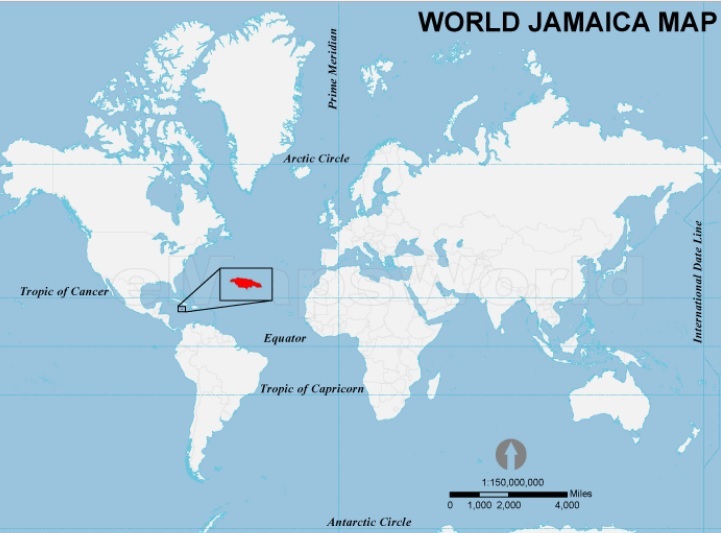 Almost at the centre of the Caribbean Sea, Jamaica lies 150 kilometres (90 miles) south of Cuba and 160 kilometres (100 miles) west of Haiti, the two nearest countries. The closest point to Jamaica in South America is Cartagena in Colombia, a distance of 710 kilometres (445 miles) almost due south. The latitude and longitude of the capital, Kingston, are about 76°47' West and 18°01' North. Its indigenous Arawakan-speaking Taíno inhabitants named the island Xaymaca, meaning the "Land of Wood and Water." Formerly a Spanish possession known as Santiago, it later became the British West Indies Crown colony of Jamaica. It is also the third most populous anglophone country in the Americas, after the United States and Canada. Be sure to read more here about the history of Jamaica, a profile of Jamaica, and the culture of Jamaica as well. Why Jamaicans run so fast? Why does Jamaicans speak English? What is Jamaica famous for? When is the hurricane season in Jamaica? Please subscribe to my free monthly e-zine My Island Jamaica Digest (MIJD) and stay with the latest from Jamaica! Return to Profile about Jamaica from Where is Jamaica? Return to My Island Jamaica Homepage from Where is Jamaica?